The best time to start to make the artificial pond when groundwater is at the lowest level. It usually occurs in late spring and early summer. 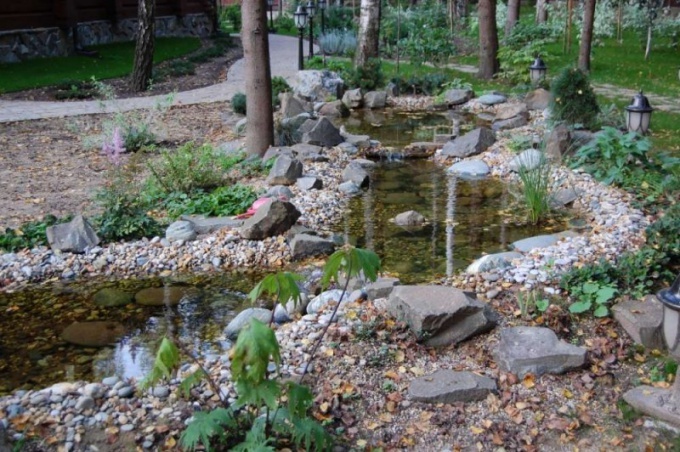 Order under the open sky to create the pond with an unusual bottom, paved with stones, you need to create a good waterproofing. Pour water directly into the pit was dug, without doing so, does not make sense, as instead of the reservoir it will bog. The first insulation layer is usually polyethylene or liquid rubber, at least - polymer bitumen or PVC. You can buy a ready-made pool, which remains only to dig, but to put it stones more difficult, as the mortar or glue on the inner walls of the tank can deform and even crack. Laying out the tape, it is necessary to capture and beach is about a meter. The film is pressed under large stones on the banks and proceed to the arrangement of the bottom. The most reliable way is to fill the stones with cement, but many of them can completely hide under the solution. Therefore, it would be best starting from the centre, to pour the concrete and strengthen it on the stones, pushing them to the solution. The solution should not be too liquid, as in this case, it will drain to the center earlier than hardens, and the stones in the center will remain in its thickness, and the stones on the sides are nothing is fixed. It is best to choose the largest and most beautiful stones in advance and wash them before cementing, as dirt will fall into the water, making it muddy. If time and patience from the masters in excess, you can use different colored small stones and place them at the bottom of any of any mosaics. It is not recommended to use stones with sharp edges, even if the pond is not planned to use for swimming. Happened to be in the water, you can seriously damage the feet such a coating. It is best to use run-water rocks, the sharp edges which in the presence of downward. When concreting the bottom of the water will need 3-4 times to fill in for about a week, and then pumped out as the concrete will produce harmful impurities, while the water will not wash out of the frozen solution. You can do without concreting and try to create an artificial reservoir conditions close to natural. To do this, on top of the film fill sand, he put the stones and pour water. Can be planted on the banks and bottom of a water plant to release into the pond fish. But the stones in such conditions will inevitably overgrow with silt and cease to be visible already in the second year. Possible to delay this moment and to minimize the risk of efflorescence water should not be used to backfill the bottom soil and clay. If in a pond to house fish, the pollution still can not be avoided, and the pond will be cleaned.